I was scrolling through Ben Hennessy’s website and looking at his illustrations. Some of it was dark - zombies and fighting. His bio, on the other hand, mentioned CBeebies. I was intrigued to meet him and discover who the real Bennessy is. The young man that invited me to his apartment and workplace was neat, organised, professional and charming. I took an instant liking to him. His background is impressive. He has done the storyboarding for Baby Jake, Chloe’s Closet, Nellie and Nora, Kiva Can Do! and Pinkalicious, amongst others. He has also done worked on a kid’s book with Brent Pope called Hip Hop Opotamus. 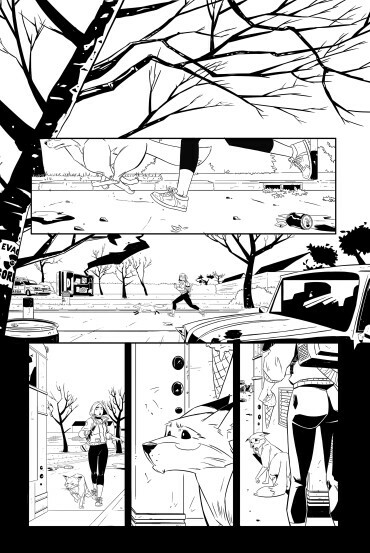 One of his proudest publications is his own comic book Carrie and Rufus, which he self-published this year. He left college in 2008 at the beginning of the recession in Ireland. “It was all doom and gloom” he said. “I tried everything. I spent days walking around Dublin, sending in flyers, emailing everyone, but rarely got a reply.” In addition, Ben says that he suffered from “eager beaver syndrome”. So, he took anything he could get. At that time, you earned 10 euros a foot and could produce 2 feet in a week. A stint working with Paul Shanahan at Kavaleer Productions had him in awe that Paul didn’t need to line test. “Paul recognised that I was hungry too”. Ben got together with fellow graduates and they set up Pegbar. They needed to meet people to get a job so they scheduled their own event. Now Pegbar has legs of its own and has become a bigger event than they can manage, so they have stepped away from it to pursue their own, now successful, careers. “The reality is that there is a big gap from being a student to becoming a professional. It is more of an effort of sticking with it than being really good at it. It is a matter of staying in the game as an OK guy and suddenly you become very relevant”. Ben gives me a piece of advice that his Dad gave him, and which he tells me helped him out in every instance: when you apply for a job and someone rings you back, tell them that you can meet them that very day - arrange your schedule around what suits them. Ben was ready to work, he loved to draw traditionally and was skilled up digitally with a 5 year degree in animation from Ballyfermot, and his Dad equipped him with the skills to win work. From 2008 to now? It is a small industry but Ireland now has two of the biggest animation studios in Europe. There is plenty of work for Ben now and work finds him rather than the other way around. His day to day work is storyboarding with great directors. “I have been working for so long now that I know what people want and I give them what they want.” He has never missed a deadline. Working as a creative from home needs a certain amount of discipline and organisation. I ask him how his days look. “My days are militantly organised” he says, “I start work at 8am. At 10am I have a break to drink some green tea and eat some nuts. From 12.30 to 1pm I take a lunch break. At 4pm I have a coffee and a protein bar and then work on until 7pm. Then I go to the gym. It helps through the day that every few hours I am forced to take a break and walk around”. This regime is also linked to his sporting interests in jujitsu and MMA. Everything is calculated and professional. Ben says that working from home gives him an extra 10 hours a week of work time (no commute) – it takes 10 hours to do a page of a comic book, so he can produce a page a week of his own comics. So, what does he like to do when he is not working? He doesn’t feel any need to get away, he says. Sometimes he heads to Wexford to see his family. The emphasis is on spending time the right way with the right people. He also goes to Comic Cons, animation events or does workshops with kids. 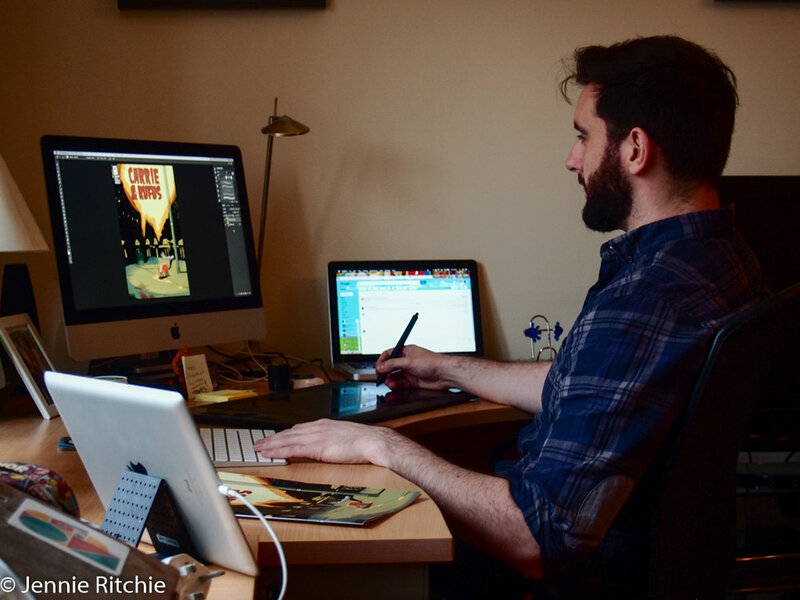 Since publishing his own comic Carrie and Rufus, which he describes as Turner and Hooch meets Shaun of the Dead, much of his weekends are spent marketing and promoting. I laugh as I ask him what he likes to watch when he is not on the other side of the animation team. “Horror” he tells me, “I love horror – I listen to horror podcasts while I work, true ghost stories too. A good audio book that I have listened to is The Witcher. At night I like to watch Stranger Things or Mindhunter. But if I watch them too late they interfere with my sleep” he laughs now too. So, Ben Hennessy, where are the spots that you love to hang out in Dublin? He admits that it is more about the people he is with than the place. He loves Dun Laoighre pier, walking in Dalkey or Klliney Hill. Recently he has enjoyed The Bowery in Rathmines, a rock and rum bar and Token, the retro arcade bar in Smithfield. As for Ben’s hopes and dreams? He’d love to draw comics, the Marvel way. For someone that loves to sit and draw, I think Ben is already living the dream.